Anyone else still full from yesterday!?!?! It was good though, worth it! Now that Thanksgiving is over and done, Hello Christmas Season! 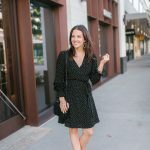 At the bottom of today’s post I have rounded up some of the best Black Friday Sales in fashion, jewelry, beauty, and home goods. Be sure to check it out and use it as your source while you do your holiday shopping today! I have my christmas list by my side for my gift shopping today, plus a few items on my treat myself list. I mean it is the perfect day to pick up a few of the beauty and fashion items I have been eyeing lately. But before we start our Black Friday shopping or continue depending when you are reading this post, let’s talk about this outfit. 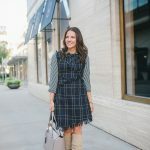 This workwear look is one of my favorite work outfits for fall. It’s a classic outfit combination I recreate within my closet over and over again. 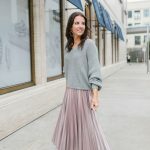 It start with a fitted top like this adorable bow tie sweater top paired with a cute skirt, and finished off with the perfect slouchy suede boots. I have a gray and black flared skirt I keep in rotation for this outfit combo. This season, I added this cute black one. I love the white details on the bottom for a different look to a solid color or full print skirt. I often pair this look with a solid fitted sweater or tee, but I couldn’t resist this adorable bow tie top with puff sleeves. I think it was made for this skirt and boots combo! It would also be cute with jeans for a casual holiday outfit. Alright ya’ll, keep scrolling down to get to my list of Black Friday Sales and Happy Shopping! Be sure to check back this weekend for more gift guides and on Monday a big list of Cyber Monday Sales along with items seen here on the blog that are on sale! See you soon. 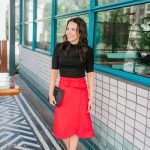 7 Responses to Bow Tie Top + Flared Skirt & BLACK FRIDAY SALES! I saw this look on Nancy’s blog. Love the style and such a cute sweater with a lovely bow tie! Such a classic chic look! Any top with a bow on it gets automatic 😍 from me! Happy Holidays! This such a chic look! I love your bow tie top and it pairs beautifully with your skirt. I love the bow sweater and the skirt. It is so chic and perfect for this time of year. elegant and chic and you always look stunning in any outfit Lauren . That skirt is so unique with the print! I love the way it flares out and think it’s perfect for the holiday season! Such an adorable outfit, you ;look gorgeous! What a fabulous outfit! Totally in love with it!